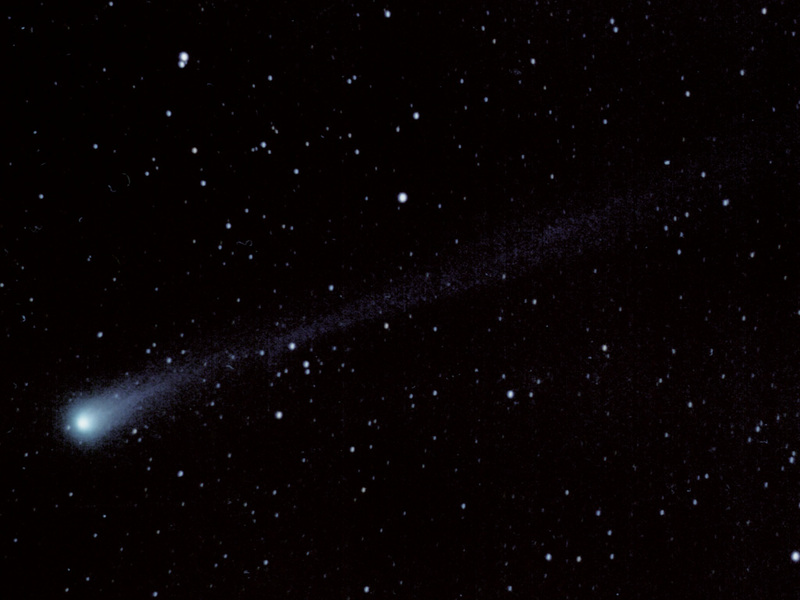 Amateur John Pane took this photograph of Comet Hyakutake on 25 March 1996 0400 UTC, in Economy, PA, USA (40 37 24 N 80 11 30 W). He used an everyday 35mm SLR camera mounted on a tripod, with a "normal" 50mm lens set at f/2.0, Kodak Royal Gold 1000 color print film, and an exposure time of about 20 seconds. The interesting region of the 4x6 print was scanned into the computer, and contrast was enhanced with Photoshop. Field of view is about 20 degrees. The tail, as visible in this photo, is about 18 degrees, or about 2/3 the length of the big dipper. Copyright John Pane. Permission to republish is granted, provided that you notify John Pane of your intent, you will not profit from the image, and you include this description.